There is nothing like it! These chocolaty morsels can't be beat. We make these treats the old fashioned way, slowly by hand in small batches. We take the best of our Blister-Fried peanuts, stir them into some of the tastiest melted chocolate and then "hand flop" them onto a cooling table. The result is various cluster sizes with the best blend of salt and sugar tastes ever! The chocolate covered peanuts are the BEST I have ever tasted!! The absolute best . Taste exactly like they did when i was a child back in Franklin ,Va. Pleasee dont mess them up by double dipping chocolate. They are perfect with one coat. These are truly addictive. I buy the case of 9 oz containers to help with portion control and to share with others. The best I have tasted. Just discovered these yummy treats! I just discovered these and am hooked. Bought at a local shop and am eagerly anticipating ordering when they are back in season. These are the best chocolate covered peanuts I have ever eaten! I ordered the chocolate covered peanuts and didn't like the low grade of chocolate used to coat them, neither was it enough chocolate. I would much rather have bought chocolate covered peanuts with a thick coating of a richer chocolate. Owner Response:We're sorry to hear you don't like our chocolate as it is one of our top sellers! Additionally, all our chocolate covered and butterscotch covered products are hand-dipped rather than coated by a machine. That creates a more home-style flavor and look - no thick coatings here. We'll be in touch regarding our 100% guarantee. I enjoy chocolate covered peanuts (CCPs). I grew up eating them. My dad carried them in his pickup truck as a snack. He would give them to me as a reward for being brave after he had to slam on the brakes and I bounced off the dash (don't blame him; that's the way they used to do it in the 50's). Apparently his left arm was not sufficiently strong to over come the effects of inertia. Anyway,these are the absolute, unequivocal BEST ever. And, You can quote me. Everyone in the office loves the peanuts I have brought back. So we decided that our clients should also enjoy your products and we prepared our own gift baskets and made the chocolate covered peanuts the center of the baskets. 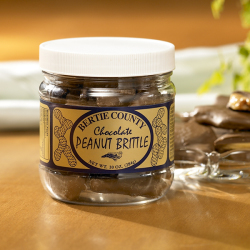 We love Bertie County peanuts so covering them with good chocolate and they are very good. Would recommend to all my friends. Fresh peanuts and delicious chocolate - a great combination and plenty to share. Too good to discuss...just eat'em! Just like the were in bygone years when you could buy them by the ounce at Woolworths 5 & 10 . Yours are the best ever!! Assume 5 means the best as they are. My boys (17 & 23), and husband, always look forward to getting them in their stocking on Christmas morning. They are wonderful. I order 2 cases of the chocolate covered nuts every year to give as gifts! Everyone loves them. BCP never disappoints and the shipping and customer service is so fast! I'm a fan!! your chocolate and peanuts are the best!!! These peanuts are awesome. I love the sweet/salty taste of the chocolate covered peanuts. Nuts & Chocolate -- OH MY! Ordered one afternoon and the peanuts shipped the next day. One order went to NY and the other to KS. Everyone loved the peanuts right in time for Christmas. Thanks !!! The best I ever ate. The chocolate is darker than milk chocolate and so gives the peanuts a great contrast. The chocolate covered peanuts are absolutely delicious. My uncle, a NC resident, gave me a jar for Christmas and they were the best chocolate covered peanuts I had ever eaten. I ordered more to share with my friends when I went back to college. I was also very pleased with the prompt shipping and delivery time. I give these as gifts fall and winter and people practically beg to get them. They are unbelivably good - the best combination possible (the butterscotch are not far behind!). These peanuts are so good and fresh. They are addictive. Could not ask for better. These are the best chocolate covered peanuts I have ever had.My husband received a jar for Christmas,and needless to day,they sure didn't last long!! I ordered some for our family soon after. My husband received a jar of these as a Christmas gift. They are the best chocolate covered peanuts ever. Our family loves them. As ALWAYS, very fresh and very yummy!!! Bertie's Chocolate covered peanuts and lightly salted peanuts are my "go to gift" for out of town friends. They love them and appreciate a taste of North Carolina Bertie County peanuts. They are the best. Chocolate and peanuts - what's not to like? I normally don't like my chocolate "adulterated" with anything else, but Bertie's peanut/salt/chocolate ratio is perfect. crawl on the floor good! I've been buying raw peanuts from Bertie Co. for 30 years, but I had never tried any of the novelty products. The chocolate covered peanuts are incredible! The semi-dark chocolate and the touch of salt are a perfect blend, setting off the peanut flavor that is found only in eastern NC peanuts. I'll never be able to eat another grocery-store peanut product! My family and I love them. The chocolate covered peanuts go in our Christmas Stockings every year. I have given these to many people, all of whom LOVE them. 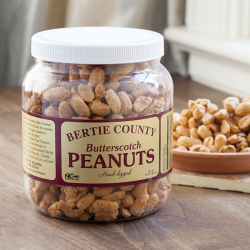 Best peanuts plain come from Bertie County but add chocolate ... and, well they are addictive! One friend refers to them as being like "crack"
Usually I am very satisfied with the products I receive from Bertie Co. Peanuts, however on this order I was very disappointed. The chocolate covered peanuts were stale and I had one serving and tossed the remainder in the trash can. I will not order them again. Bertie County Peanuts I know you can do better. Peanuts and a bit a of chocolate. It don't get any better. Something to share from back home. I gave your chocolate covered peanuts as gifts one Christmas to my in-laws as something from back home that they might enjoy. The next year, everyone was disappointed; we had different gifyts and they had "been looking forward to getting those peanuts again". So now I must order some every November. P.S. I can taste the Bertie County dirt, the way it smells, in the peanuts, having grown them with my dad, "Plucker", back in the day. Best chocolate covered peanuts, and fast delivery was exceptional. I ordered these among other peanuts for Christmas, however, these looked so tempting I had to open them. The are the best chocolate covered peanuts I ever ate. They taste like they were fresh dipped in chocolate right before your eyes. Excellent. All products I purchased were very good!!! Fast shipping and great customer service. I was raised on Sheriff Garrett Rd. When I found a way to order them, I jumped on it and am sure I will be ordering More in the future. My husband, Vernon Turner lived at Bunea Vista, so you know you have 2 fans. Owner Response:We're sorry to hear that the heat melted the chocolate! But, we'll be in touch regarding our 100% guarantee. Everything I purchased was great and the grandchildren are pestering me for more. The Choc covered are sinfully good. I had to burn your catalog to keep from ordering a truck load. These are the freshest and most delicious chocolate peanuts I have EVER had!! I wish I had ordered more. These chocolate covered peanuts are so good that we fight over them at home. Whenever we offer them to a guest they take one mouthful and immediately they GRAB for more! I love that they are not too sweet and the chocolate is dark. HIGHLY recommend! Rich dark chocolate over the world's best peanuts.Not too sweet-just right! Hubby loves them! Will be ordering more. Recipient reports too much chocolate that overwhelms the peanuts. I received a small jar of the "Blister Fried Chocolate Covered peanuts" for Christmas every year from a child on my school bus route, until he started driving himself to school! I could not share them with anyone - They were that good! I finally tracked them down and ordered them - They are still Awsome! I bought big jars this time - so I could SHARE! Your Chocolate Covered Peanuts are the BEST of all its kind that I have EVER tasted in my life! My coworkers were also blown away! Wish I could order ALL year long! Saw an ad in Southern Living, so I decided to order and I'm glad that I did. The chocolate covered peanuts are wonderful. Love how they are hand dipped. No thick chocolate. They're perfect. Also the chocolate covered pecans are just as wonderful.. The Chocolate Covered "Blister Fried" Peanuts are AWSOME! We just finished eating one container. They're so good, we'll need to buy more. They didn't last a week!!! No one in the house could keep their hands out of the jar! Best chocolate covered peanuts EVER! The best chocolate covered peanuts EVER! Amazing sweet treats-we always send these peanuts as gifts and everyone loves them!!!! With out a dought the best chocolate covered peanuts I have ever had!! Sent the chocolate dipped peanuts as Halloween gifts - recipients said they are just wonderful!! I really like these, I have to pace my self. I order these and the cashews every year. Never disappointed. The chocolate covered blistered fried peanuts remind me of trips to Sears & Roebuck's roasted nut stand as a child and are always EXCELLENT! Chocolate covered peanuts are simply addictive!!!!! The dark chocolate covered peanuts are so delicious, it is hard to stop eating them! These are the best chocolate covered peanuts EVER!! I got my order in 2 days. I've been buying these choc.-covered peanuts to give to friends for Christmas for years. Everyone loves them! Best chocolate covered peanuts on the market. We buy the 9 oz jars. It would be hard to stop eating with the larger size. My new " go to" snack They are the very best ! I serve as a dessert everyone loves them I also give as gifts They are nutritious also The chocolate is superb A great product. These chocolate dipped peanuts are the best we've ever tasted! I bought the chocolate covered peanuts for my parent's Christmas gift because they have everything and need nothing! I called my Mom to make sure the package arrived and she could not stop talking about how good they were! We'll definitely be repeat customers. We order from Bertie every year and haven't been disappointed yet! Great product and excellent customer service! Purchased as a Christmas gift and my mother-in-law gave them two thumbs up! The best. Makes a good gift. I wish free shipping was offered if enough product is ordered ?? These chocolate covered peanuts are the best! Received some as a gift; then had to order more for myself and my son...he thinks they are superbly fantastic!! I ordered these for my grandpa as a surprise. He loved them and went on and on about how much he loved this surprise treat from Bertie County Peanuts. Thank you for helping me make his day! These are the best chocolate covered peanuts, ever!! Chocolate covered peanuts combined with Blister Fried peanuts are the ultimate, awesome and comforting snack food!! These are the best you will ever eat. Not too sweet and always fresh. These nuts are a MUST for my mother in law in NJ. I send them to her for Christmas every year. Love these! One of my favorites! Great for Christmas gifts! Highly recommend! We received a gift pack of 3 varieties of peanuts for Christmas. We ran out far too soon and reordered as soon as possible. The peanuts were very crisp and seasoned just right. Will be re-ordering again no doubt! 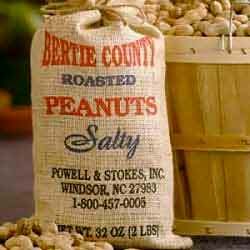 Berties County Peanuts are AWESOME!! My husband loves the sea salt and pepper and the hotter varieties ... but I love the blistered peanuts and the CHOCOLATE COVERED!! It doesn't get ANY better!!! Thank you Bertie County. This is the 2nd year that I have ordered a case of the chic covered for gifts for Christmas!! Bertie county has the best peanuts out there. I have bought from y'all before & just love the nuts! PS if you do want the reviews take out the captcha verification. I had these at Christmas and my grandson immediately fell in love. He lets me know when he runs out! On a recent trip to South Carolina I purchases the chocolate covered peanuts at gift shop. Loved them so much when I returned to Michigan I order some for me and for gifts. Love Bertie County Peanuts. All of em! The chocolate covered peanuts are a favorite ... so fresh and tasty. They do not last long around me. I agree with Frank Ellis, please please don't double dip! You have achieved the perfect peanut to chocolate ratio! I used to live in Franklin, VA too and remember the chocolate covered peanuts there and always missed them until i discovered Bertie County Peanuts. These are a family tradition at Christmas. We all love them. Great product. Over the years everything we have used has been top quality. 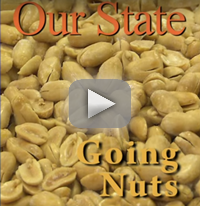 Best nuts in N.C. 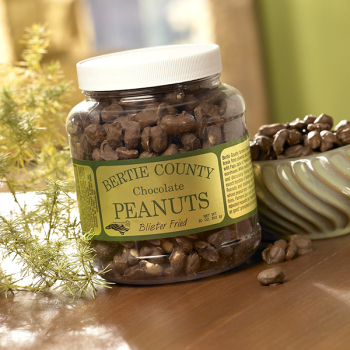 These Bertie County Chocolate Peanuts are excellent and would recommend to anyone. I received Bertie County lightly salted roasted peanuts and chocolate covered peanuts for Christmas and have already ordered more. These are the best peanut products I have had the pleasure of enjoying in my long life. Good online and delivery services also. Thanks! Bertie County Dark Chocolate covered peanuts are the best! Very dear friends gifted me the chocolate covered peanuts one Christmas, so now they are my go to treat for friends and relatives ! Blister Fried Chocolate Covered Peanuts Are Amazing! These Peanuts have been a personal favorite for Decades! They taste soo good, I could eat a whole jar at one time! Bertie County peanuts are the best peanuts you can buy. They offer a terrific variety to please all peanut lovers. I have ordered numerous times over the past years and they are always fantastic! Good chocolate and the best peanuts equals tasty treat!